You probably know what it's like to have to cram the loot from an end of month shopping trip to your favorite wholesale shopping club into a standard upright refrigerator. There is nothing fun about it. For this reason, freezers like the GE chest freezer can be lifesavers. Where can chest freezers be purchased? How Much Does a GE Chest Freezer Cost? Sure, not every household needs one. But more often than not, a standard upright refrigerator cannot handle the workload of a dedicated chest freezer. Between meats, frozen meals, frozen fruits and veggies for your favorite shake and the bargain items on sale that you couldn’t afford to pass up, there simply isn’t enough room in your upright refrigerator’s freezer space. And even if there’s space, sometimes mixing all these items in a small space isn’t necessarily a good idea. That's where a chest freezer can help you make your life easier! 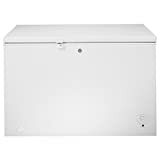 A chest freezer, is generally shaped like a chest, hence the name. It has a hinged lid that opens upward instead of a door, and it is horizontal instead of vertical like a traditional refrigerator. Chest freezers are a great option for storing bulky items that do fit well in the small freezer space of a refrigerator. Chest freezers are a great option if you make a lot of bulk purchases. 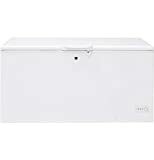 But beyond the advantage of more storage space, chest freezers are also known to use less electricity than uprights. They also prevent freezer burn better than uprights and will keep food frozen longer than an upright in the event of a power outage. You will not have any trouble finding a retailer to buy your next GE Chest freezer. Home Depot, Lowes, JCPenney, and the GE website all sell the freezer. Before we get down to it, you’re probably curious to know how we came up with this list. GE is a trusted brand in the world of home appliances, and when it comes to chest freezers, their reputation is no different. So while we could’ve written a review of different brands, for this review, we opted to look exclusively at GE chest freezers. We took a look at GE’s line of chest freezers for 2018. We sought out reviews from real customers who are owners of GE chest freezers and who provided feedback on their experience with these freezers. Then we compared the models using standardized measure so you would get the most objective review possible to help you with your next GE chest freezer purchase. 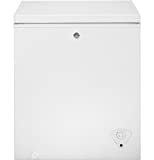 A GE chest freezer costs between $200 and $850. The price will depend largely on your needs. A larger capacity will obviously cost more. Now let’s get down to it. GE currently has six chest freezer models available on the market for 2018, and all six models are listed below in no particular order. 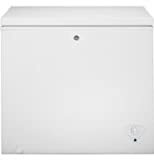 This GE chest freezer model is the smallest available for purchase. The freezer has a capacity of five cubic feet, and it is a great option for smaller households that require less storage. The unit features manual defrost a removable bulk storage basket and an external power “ON” light. Additionally, it has adjustable temperature control and an external thermostat that allows you to regulate temperatures between -10 degrees and 15 degrees Fahrenheit (F). The MSRP for this unit is within the range of $175 to $210; it also comes with a limited 1-year warranty. With a capacity of just five cubic feet, the unit is a nice compact size which will make it easier to find a spot in your home for it. However, with a larger family or greater storage needs, it may not be the best option. Home Depot customers rate the freezer 4.7 out of 5-stars, and 96 percent of customers say they would recommend it. This seven cubic feet model GE Chest freezer is another great budget option that gives a lot of storage sufficient for a small family. It is 40 percent larger than the FCM5SKWW and has an MSRP of $239. The unit has a convenient external temperature knob, and manual defrost. It also has an easy-access front drain for defrosting, two removable bulk storage baskets, and cabinet liner. The freezer's foam insulation make it quieter than it’s smaller counterpart that we discuss above. It comes with a limited 1-year warranty. Many buyers comment that this is one of the quietest chest freezers they’ve ever owned and are very impressed with that feature. While it gives more space than the smaller FCM5SKWW, it’s still very compact and easy to fit into most living spaces which makes it a great buy. Home Depot customers rate the freezer 4.6 out of 5-stars, and 95 percent of customers say they would recommend it. This larger GE unit has enough space to store up to 11 bags of groceries. It has three removable storage baskets and is energy star certified with an estimated annual electricity consumption of 218 kWh/year. Just like the FCM7SKWW, temperature controls are on the front of the freezer. The unit also boasts an internal light to make it easier to see what’s inside. With an external lock, you never have to worry about the kids finishing the ice cream without permission. The MSRP is around $450, and it comes with a limited 1-year warranty. Depending on your budget, its price may seem like too much to pay for a freezer that supplements your standing refrigerator. However, it has a lot of storage space, and it is energy efficient. Home Depot customers rate the freezer 4.7 out of 5-stars, and 96 percent of customers say they would recommend it. With a high-temp indicator light on the front, interior LED light, two sliding storage baskets, and the option to lock the unit with a key, the FCM16SLWW is a great buy. For large families or individuals in need of plenty of storage, 15.7 cubic feet should do the trick. The unit also has a defrost water drain which makes defrosting a breeze. The MSRP is around $550, and it comes with a limited 1-year warranty on the entire appliance. However, for such a large unit, we expected GE to provide more storage bins to allow for better organization. It seems odd that the unit has fewer storage bins than it’s smaller counterpart the FCM11PHWW. We’re also surprised that the unit isn’t Energy Star certified. Home Depot customers rate the freezer 4.8 out of 5-stars. Additionally, 83 percent of customers say they would recommend it. At a glance, the FCM16DLWW is the same size as the FCM16SLWW that we reviewed before this. It costs $100 more, with an MSRP of around $650. The freezers may be the same size, but they are quite different. For starters, this unit is energy star certified and has an audible temperature alarm unlike the FCM16SLWW, which only has an indicator light for when the temperature increases. This unit also has a total of four storage bins for organizing food, which makes sense based on its size. It also has an interior LED light, external power ON light and the option to lock the door with a key. The unit comes with a limited 1-year warranty on the entire appliance. We love that the FCM16DLWW is energy efficient and appreciate the number of storage bins for organizing foods. We find the price tag to be a bit hefty though. Home Depot customers rate the freezer 4.0 out of 5 stars, and 84 percent of customers say they would recommend it. The 21.7 cubic feet FCM22DLWW is a good option for those who take their membership shopping seriously. Whether you’re stocking up on smoothie supplies or storing your summer favorites for winter this freezer has enough space. 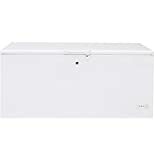 This GE chest freezer is an excellent option for much larger families or those who do a lot of cooking. It defrosts manually, has an interior LED light, and is also Energy Star verified so you can count on it being energy efficient. With five sliding bulk storage baskets, the possibilities for customizing your freezer are many and varied. One of the more impressive additional features of the FCM22DLWW is the audible temperature alarm that goes off if the temperature rises. It has an MSRP of $850. The freezer also comes with a limited 1-year warranty on the entire appliance. With the hefty price tag, you may want to consider the more affordable FCM11PHWW. At 33.4 inches by 73.3 inches you will also need to give serious consideration to where you will store it, as it will take up quite a bit of space. Home Depot customers rate the freezer 4.8 out of 5-stars and 86 percent of customers say they would recommend it. 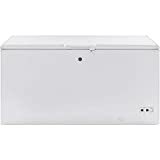 While the specific GE chest freezer you decide to purchase will be dependent on your needs and budget, we believe the GE 10.6 cubic feet Chest Freezer in White (Model# FCM11PHWW) is a good mid-range option. Its 10.6 cubic feet is enough space for the average household, and with an MSRP of $449, we believe it’s a good buy. The size means you won’t have to rearrange your entire space to find a home for it or turn your basement upside down to make space. The fact that this model is Energy Star certified ranked high on our list of reasons for selecting it as the best GE Chest Freezer to own. Also, since the unit has a lock, you also get peace of mind and freedom from having to worry about who’s sneaking into the freezer at night to take ice cream or other frozen treats without permission.